Previous What Is Connected Learning? On Friday, we'll have our next #OpenTeachingOU Twitter Chat. The topic for this session will be "Textbooks and the Content Ecosystem." I've posted a number of background resources to help provide context for our discussion, and Laura Gibbs has added valuable insights about the role of student-created content. What we haven't addressed in any detail, however, is the actual textbook industry itself, its history, and its rise to prominence within U.S. Higher education. To that end, I am posting here the second chapter of a book I published in 2012, The Future of learning Content (for access to bibliographic notes please download the PDF version). There is broad support for the notion that textbooks cost too much and yet few people really understand the intricacies of the textbook publishing industry, including its relationship to our educational systems, and why the products cost what they do. 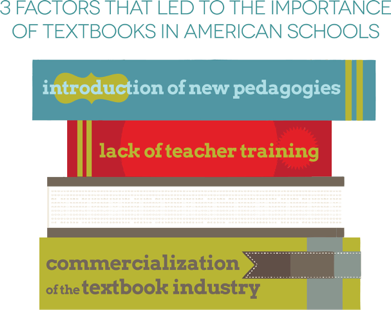 Indeed, textbook publishing is one of the more misunderstood industries in the U.S. This is a natural consequence of being so similar to the rest of the publishing world and yet, at the same time, being so very different. It is also the result of contending with a closed, centralized industry that resulted in a de facto collaborative monopoly for the better part of fifty years. Within the world of learning content, textbooks have long been the center of the universe. This is because they have evolved as such an integrated part of both pedagogy and curriculum throughout our educational system, and because textbook publishing has represented the lion's share of commercial potential with regards to content. This also means that the textbook publishing industry has more to lose than any other market player over the coming decade. At the same time, one can argue that textbook publishers are also in the best position to seize the opportunities that will arise from the coming changes. The bottom line is this: if you want to know how the learning content world is going to shake out over the coming decade, first and foremost you need to gain a clear understanding of how the textbook business really works, what its strengths and weaknesses are in the present day education market, and how it impacts education both directly and indirectly. Textbooks as a product model have served and continue to serve an important role in the U.S. education system. This is particularly true in core subject areas and in the general education courses required for a higher education degree. So we can operate with a common vocabulary, let's start with a general definition of textbooks. Textbooks are collections of study and reading material related to a specific discipline or course. There is more to a textbook than its content, however. In particular, textbooks in the U.S. have, from the beginning, combined their content with either an implied or explicit philosophy of teaching and learning. This embedded pedagogy—how to teach and how to learn the material—has informed classroom instruction in the U.S. and has evolved as an integral part of curriculum planning and delivery. As I discussed in the previous chapter, textbooks in the U.S. have their deepest roots in frontier expansion and the need to provide essential and common literacy and arithmetic skills to children across the United States. The oft-cited examples of the early textbook movement are New England Primer (18th century) and the McGuffey Readers (19th century). Another work we should add to this list is the Noah Webster's three-volume work, A Grammatical Institute of the English Language. As a teacher, Webster had seen the effects of poor teacher training, overcrowded one-room schoolhouses, and the use of European textbooks that lacked important American contexts. As a result, he created a speller, a grammar, and a reader with the specific goal of delivering an American training to American students. The speller, which sold 60 million copies by the end of the nineteenth century, was designed specifically for easy instruction and the support of progression through grades. A: Grammar is the art of communicating thoughts by words with propriety and dispatch. Q: What is the use of English Grammar? A: To teach the true principles and idioms of the English language. Learning content designed for memorization and recitation under the watchful eye of a monitor gave way to a more evolved, object teaching design which was endorsed by the school and teacher reforms advocated in the Common School movement. An early example of this object teaching approach to learning content can be found in Warren Colburn's book first published in 1821, First Lessons in Arithmetic on the Plan of Pestalozzi. In this textbook, the idea was that the student already possessed an understanding of quantity through experience, so what was needed was a series of questions that would help him or her unlock the understanding of that experience. How many thumbs have you on your right hand? How many on your left? How many on both together? How many hands have you? If you have two nuts in one hand and one in the other, how many have you in both? This shift in the approach to learning was reinforced by the teacher training movement driven through the Common School movement. In particular, teacher training expanded rapidly through the establishment of normal schools and a preferred method of instruction taught at these schools was object teaching. This was further reinforced by the commercialization of the textbook industry that looked to take advantage of a demand for learning materials spurred by school reform efforts. In the K-12 market, at least, this has become the relationship and traditional cycle of evolution with regards to learning content. National or regional school or educational reform efforts emerge and these are necessarily embraced by teacher training institutions in order to ensure that future teachers are relevant and current in their methods. In order to support new reforms, and to enhance their chances for adoption, the textbook industry embeds the new or evolved pedagogy into its books. In this way, the government, educational institutions, and the textbook industry have worked together independently to make textbooks an integral component of K-12 learning. With the passing of each decade, textbooks and their ancillary materials have become more deeply embedded as a core component of the education solution that can no more be left out of the equation than the teachers themselves. In higher education, textbooks have also become integrated into actual instructional and learning design of departments and institutions, but the path leading to that integration is different than the one we have described in public school education. In the university sector, the reform analogous to the Common School movement occurred through the changes introduced into higher education by Harvard University's president Charles Eliot (1869-1909). Among Eliot's principle reforms were the professionalization of the professoriate and the standardization and legitimization of professional degrees for doctors, lawyers, and other learned professions. One result of this reform was a natural tension between the notion of the university as a utilitarian enterprise designed to support the economic growth of the U.S. and the ideal of the university as a place of higher learning that championed general enrichment on personal and societal levels. The resolution of this tension over the ensuing century has been the general education or core curriculum, the course set all university graduates must take regardless of their degree choice. And, while the required courses vary from institution to institution, the general education requirement has become a mainstay of higher education in the U.S. and its courses account for the largest enrollment numbers. If general education requirements drove enrollment for a common set of specific courses, the GI Bill provided the foundation for an explosion of enrollment in higher education from 1948-1970. This broad enrollment increase went hand in hand with a growth in professional degrees and the overall course catalog for universities and colleges. These two factors, the general education curriculum and the enrollment and program increases precipitated by the GI Bill, led to the parallel growth of the textbook publishing industry for higher education. In particular, the swelling ranks of university students meant that textbooks targeting the general education courses now had impressive markets in which to sell. Of course, the increase in course sections taught in the general education level also led to a rise in inexperienced faculty and teaching assistants. As a result, throughout the 60's, 70's, and 80's, textbook companies added layers of instructional support and guidance to address the training gap and to make their products more attractive to adopters (instructors and institutions). In the end, just as Webster and Pestalozzi had attempted to introduce instructional quality into schools by mixing pedagogy with content, higher education textbook publishers and authors began integrating their products more deeply into institutional planning and outcomes. What's In A Textbook (Or How Sausage Gets Made)? Of course, if you really want to understand the textbook business, you need to have a good understanding of how textbooks are actually created. In fact, this is one of the areas in which we see significant divergence between the trade publishing industry and educational publishing. I'll start with an overview of higher education textbooks, and then discuss the salient differences between these and the products created for the K-12 market. Naturally, it all begins with an author or a group of authors who can write the content for the textbook. Unlike in trade publishing, where authors submit manuscripts to agents who, in turn, pitch projects to publishers, textbook authors are generally discovered, courted, and cultivated based on a variety of factors. In general, textbook authors are selected based on their academic pedigree, their current position and ability to influence large adoptions (program coordinators at large universities, for example), general standing in the teaching community, and their writing history. Particularly in higher education, lead authors are viewed as important brands in their own right, and publishers will attempt to generate a small list of titles related to these brands in order to maximize their investment and to lock in the author's commitment to the publisher. Potential authors are often cultivated by hiring them first for non-royalty projects such as writing quiz banks or other ancillary materials. Those who prove reliable, who are good writers and have other attractive qualities, are then encouraged to submit a textbook proposal. Once a proposal is received from an individual author, the editorial team will generally brainstorm about what other authors they might add to the team. The purpose of this is to extend the potential adoption reach (two authors, each from sizable institutions in different parts of the U.S., is a great combination), and to allow different team members to write to their particular areas of strength of specialty. Once the author team is formalized and a basic proposal has been put together, contracts are written and the real work begins. In higher education, most textbook authors work on a royalty basis and first-time authors are offered a royalty of 10%-12% on average. In competitive signings, those where multiple publishers are vying for the same author and project, the royalty may go higher. This royalty is the total amount carved off from the net sales of the book and distributed among the author or authors. In some instances, an author may receive a grant, or one-time stipend, as a reward for signing with the publisher. This amount is usually modest, however, as the goal of the publisher is to "borrow" as much labor as possible from the author(s) during the creation process without having to pay for it until after the product is published and sold. Now that the authors are signed, the next step is to create a complete textbook project proposal and a sample chapter. This will allow the Acquisitions Editor—the editor responsible for signing new projects and assisting with their development—to create a more accurate budget, and will also allow the Developmental Editor and the Marketing Manager to create a sample that can be reviewed and tested by actual instructors and students. Keep in mind that at this stage, even though the textbook project has been signed, it has not received full budget approval. This approval won't come until the editorial and marketing teams have completed a thorough competitive analysis, conducted a market survey using the sample chapter, and collected anecdotal comments from pilot users. The presentation will also include projected unit sales based on market research. With that information in hand, the Acquisitions Editor or Publisher will conduct a review with the Editor-in-Chief and/or other executives, and a decision will be made on the viability of the project. In other words, the project will be approved for funding or rejected. If the project is funded, the authors will gather with the editorial staff for planning sessions and the timeline for the project will be finalized. As a rough rule of thumb, from signing to actual delivery of the product to bookstore shelves or e-book sites, the project will take between 2-3 years to complete. This length of time is determined by the writing schedule, the number of marketing reviews required, the number of pilots, and the complexity of any associated technology. Remember that, depending on the particular textbook project, there may be 3-4 ancillary packages, a video script, and other technology components that have to be authored and produced in addition to the textbook. During the actual writing and creation process, the author(s) will work closely with the Developmental Editor and the Assistant Editor for the discipline group. As the project moves through its various phases, authors will participate in evaluating feedback from focus groups, hosting pre-launch marketing presentations at discipline conferences, and provide feedback on design and layout for the project. Final manuscripts are sent out to Copy Editors, the completed textbook and art manuscripts are handed off the publisher's production team, and, eventually, everything is given over to the compositor to create the final, press-ready book files. These files may include an ePub version of the book or, in many cases, a press-ready PDF is sent to offshore vendors for XML markup. At the end of the process, after 2-3 years of labor and waiting, a new textbook is launched into the market. By the time it is actually published, multiple writers, editors, production specialists, technology experts, and marketing specialists have contributed to the project. In addition, the product has been reviewed by numerous faculty members and has been used in significant pilots in order to test its usefulness. Of course, knowing what goes into a textbook is only one piece in understanding the industry. You also have to understand how the textbook itself fits within the overall business models for publishers. Let's begin by looking at a the publisher's catalog or list of textbook titles for sale. Within each of these super headings, the organization is broken down further. Languages, for example, is often broken into separate groups for the primary languages (in terms of units sold—Spanish, French, and German), as well as a separate bucket for lesser taught languages. It is inside of each of these areas that the actual catalog of titles for a publishing company emerges. Textbook projects are signed and produced for the major course areas within each of these discipline groupings, that is, those course areas with national enrollments and adoptions large enough to warrant representation in the catalog. The goal of a strong catalog for a major publisher has always been to provide as much direct competition with rival publishers as possible, as well as clear choice and product differentiation within its own list of titles. In a major course area, it is not uncommon for a publisher to have 4-5 different textbook products, each with a different author. McGraw-Hill, for example, has as many as five Introductory Spanish books in its catalog at any given time. Naturally, all of these products have the same grammatical content, similar scope and sequence for presenting content, and roughly the same vocabulary. They differ in pedagogy, breadth of material covered, reading materials, and approaches to culture. For the publisher, this product differentiation within the catalog is critical. It allows sales representatives to appeal to a wider set of possible teaching preferences, and to respond to similar differentiation by market competitors. Managing the catalog extends beyond ensuring that discipline and course lists are competitive. It also means keeping up with timelines so that all product lines remain fresh and new titles are introduced at the right moment. New products, in fact, are the lifeblood of most textbook publishers. After all, the first year of a first edition of a new textbook title is the only time the publisher will ever have a guaranteed sale of a new product—there is no used market or previous edition to compete with. For this reason, one of the important success milestones for any editorial group is new project signings. These new signings represent future sales projections, new authors who represent strategic adoption opportunities, and a diminishing of revenue leakage to used books (traditionally around 35% of total textbook sales). In addition to managing the catalog to optimize competitiveness and the sale of new textbooks, publishers must also manage their costs in a way that minimizes risk. With regards to cost control, publishers attack the problem from a variety of angles. One strategy over the past decade has been to look for cheaper printing alternatives in order to drive down the costs associated with paper and binding. Publishers have utilized printers from China, Indonesia, and India to get better deals, but have also struggled with printing and shipping delays, as well as with various quality issues. Another strategy for controlling costs is the increased use of contract labor. Many tasks completed formerly by in-house staff have been moved outside the company where rates are lower and benefits do not have to be paid. As a result, Developmental Editors, Copy Editors, Project Managers, and Designers are increasingly outsourced positions. Of course, one of the best ways for publishers to control costs is by not having to pay their primary talent—the authors. By having authors work against future royalties, publishers are able to enlist smart, energetic, and vested partners for several years without having to pay them out of their operating expenses. Managing costs is certainly important for publishers, but equally important is their ability to create financial forecasts that are highly accurate. This allows them to assess the real value of new projects and to manage their net revenues tightly. As a general rule, all major publishers have strong track records when it comes to forecasting product results. While the reliability of their forecasts have eroded somewhat over the past three years, their underlying models still provide a good deal of stability for the companies. This accuracy is derived from proprietary in-house software programs that take all of the information about products and their variables and translate it into probable outcomes. The accuracy of this software is based on the mountain of historical data the publishers have and against which they can factor their projections. Forecasting proper budgets and outcomes for new projects is particularly important because it is based on these forecasts that the publishers actually loan the money to their divisions to cover production and marketing costs. Plant Costs — The largest costs associated with a textbook project are editorial labor, production costs, and media development. The actual printing and paper costs represent a smaller portion of the overall budget. Estimated Sales Revenue — Sales revenue is broken out by product component – textbook, online assessment component, etc.—and by year within the life of the edition—generally a three-year period. 70%-80% of the revenues will be generated in Year 1 since there is little leakage to used product sales. By Year 2, the revenues drop precipitously, and by Year 3 the projections for new revenue are inconsequential. Net Return — This number represents the sales-revenue-against-plant cost and is presented both in terms of estimated net revenue as well as a simplified number that represents the factor of return-related-to-plant costs (such as 6X or 10X). This number actually represents the "bottom line" when it comes to decision making, and in order for a project to receive funding, it should promise a return of 5X-6X plant investment.